Eickemeyer Jr. Rudolf. FROM ALABAMA. African American Man Circa 1910. Silver Print 7 1/4 x 9 1/4 inches on a larger mount. This had been tipped-in to a copy of "The Photographic Times. " The image is printed on carbon velox paper and is titled and identified in the border below the image. There is some silvering and surface marks. 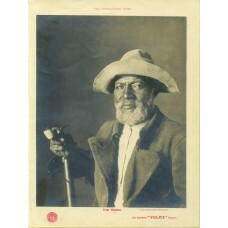 this is a wonderful image of an old African American man holding a pipe.